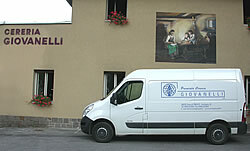 Stefano Giovanelli, who was born in 1744 in Fontanedo (Roncone), owns a pharmacy in Roncone which adds a grocery store in 1780 and then a candle factory. From Stefano the business passed to Bernardo who was born in 1774 and to his sun, Stefano Ottavio, born in 1800. In the 1864 Stefano Ottavio Giovanelli sold the pharmacy and to the Giovanelli remains the candle factory, which moved to Tione in 1902 by Giuseppe Giovanelli. The events of World War see Tione on the front. The candle factory had been confiscated, the machines dismantled and in the candle factory itself had been set up the headquarters for the horses infirmary of the Austro-Hungarian Empire near the front. 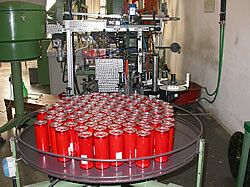 After the war, the candle factory resumed its activities. On the death of Giuseppe Giovanelli, in 1926, the business is continued by his son Guido Giovanelli with his son Joseph. The work in the difficult times of war and the previous crisis has been hard, either for lack of resources and materials. After the war Cereria Giovanelli had increased its activities, going to look for new markets beyond its valleys, expanding its marketing area more than all over the Trentino, in the Alto Adige_South Tyrol and the neighbour provinces. Initially facilitated and encouraged by commercial agreements between "Trentino-South Tyrol & Tirol Vorarlberg" begins the first exports to Austria which got quickly more and more successful, up to enable the company to obtain the regular exporter status in the light of the current Article 8 of Presidential Decree 26/10/72 No. 633. Currently exports involve several European and non-European markets. For many years the company has been taking part in regional and national fairs and exhibitions. In recent time the company has been completely renovated both in the buildings and in the production, so that today, alongside the always accurate and sophisticated craftsmanship, boasts technologically advanced systems that allow to deal with the ever changing market needs, providing its customers high quality products. The tradition continues and the work and art for over 230 years has been handed down from father to son, remaining in the family and generations Giovanelli. Today, the candle factory is managed by Giuseppe Giovanelli, who is the legal representative, along with three sons: Mr Antonio (sales and production manager), Mrs Roberta (finance & accounting manager) and Mrs Marcella (art & design manager). During the awards ceremony of the 150 oldest companies in Italy, held in Rome on the 8th June 2011, even our Giovanelli candle factory was awarded with the license plate "150 Italy. The roots of the future " and was included in the prestigious Register of the memorable companies of Italy.